Firewall Fortify is security software that helps prevent the theft of your private web data such as bank accounts, passwords, credit cards and other kinds of personal data. The application monitors all outbound Internet traffic from your computer in real-time and alerts you before your sensitive information is sent out to other computers or websites without your permission. The system security tool can monitor an unlimited number of items in your phrases list and private words to protect your emails, IDs and bank accounts. After checking the phrases list and private words, the program examines Internet connection and intercepts all Internet traffic that contains any of your personal data. You can allow or block such data from being sent out to the Internet. Apart from this, the Firewall software protects your all financial information from being stolen by phishing sites or posing as legitimate websites. 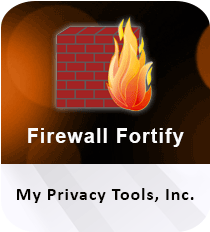 Download Firewall Fortify to safeguard your sensitive data against various potential threats. The Windows application ensures a spam-free online experience by allowing users to view trusted/blocked IP list before accessing any personal data. The Firewall helper utility features Runs on Startup. Once enabled, free Firewall Fortify will start each time when Windows starts and instantly monitors and protects your Internet connection. It includes a setup wizard that guides users through the installation process. The utility can run on PCs running Windows XP, Windows 7, Windows ME or Windows 8. Firewall Fortify is advanced Internet security software that provides an extra layer of security to your private and sensitive data. Give this security & privacy application a shoot now if you are worried about the disclosure of your personal data when you are using the Internet.